Madison Vorva, who goes by Madi, has accomplished a lot. Madison Vorva, a senior at Pomona College in Southern California, combines her passion for conservation and human rights with technology to effect real change. She campaigned to get the Girl Scouts to stop using unsustainable palm oil in their cookies. She convinced Kellogg’s, leading producer of cereal, cookies, crackers, and savory snacks, to agree to a deforestation-free policy for all its products. She has studied land rights in Colombia, traveled to Cambodia to make a short documentary on a politician fighting for victims of land grabs, and observed how palm oil farming affects local communities in Malaysia and Singapore. She is a United Nations Forest Hero and was honored at the Teen Choice Awards. She sits on the board of the Jane Goodall Institute (JGI). She recently hosted a television program to show kids—especially girls—how fun and important science and technology are. She’s developing GIS-based curricula to get youth more involved in service learning. She’s currently working on her thesis. Madi is only 21 years old. As Girl Scouts, Vorva and her friend, Rhiannon Tomtishen, set out to discover why orangutans were endangered and quickly found out that palm oil—an ingredient in Girl Scout cookies—contributed greatly to their plight. As a Girl Scout trying to earn her Bronze Award, she and her friend, Rhiannon Tomtishen, put together an awareness presentation about why orangutans are endangered. The two friends learned that one of the biggest threats to these primates is the deforestation that is occurring to make room for palm oil plantations. Given that palm oil is in about 50 percent of packaged grocery store products, the girls felt they had to do something. They created orangutan week at their school, hosted palm oil-free bake sales, and put on a middle school dance to raise money for conservation. Then one day, Vorva flipped over a box of Girl Scout cookies and saw that palm oil was an ingredient. “That was really shocking because I’d sold the cookies since I was in first grade,” she said. That year, she and Tomtishen sold magazines instead of cookies. They’d planned to boycott the baked goods until the Girl Scouts stopped using palm oil in them, and they started a petition on change.org to get others to join in. They even attended a conference for Dr. Jane Goodall’s Roots & Shoots program, which inspires kids around the world to create community action projects, to see if Goodall would sign the petition. In addition to signing the petition (along with 70,000 other people), Goodall got Vorva thinking about sustainability and what that meant. The girls reached out to the Rainforest Action Network, Union of Concerned Scientists, and other similar organizations to partner with them on the campaign. That’s when Vorva started to realize that palm oil farming not only threatens orangutans but is also linked to the displacement of indigenous communities and child enslaved labor. Part of the Girl Scouts’ mission is to advocate respect for the earth and encourage using resources wisely. Vorva and Tomtishen remained members of the organization throughout their campaign and worked to change it from within. They started a Rainforest Hero badge and sponsored art projects to help girls learn about the palm oil issue and its connection to deforestation. Soon, the girls were a running a nationwide campaign. 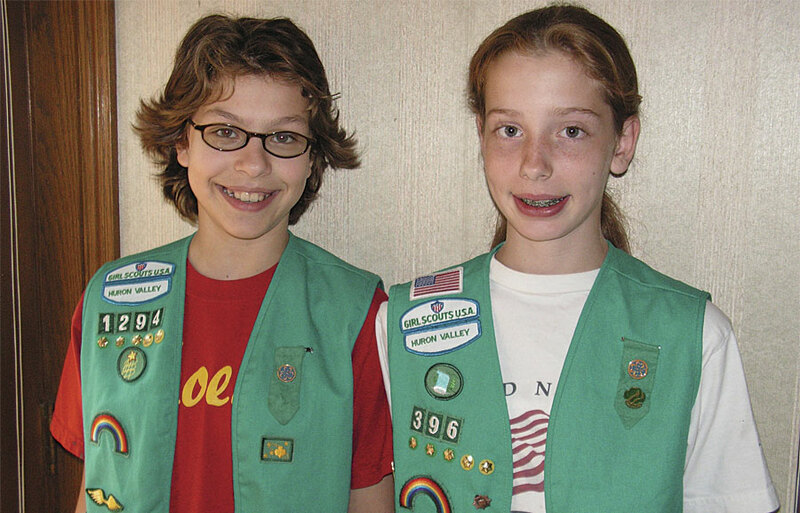 When Girl Scouts USA agreed to meet with Vorva and Tomtishen at their headquarters in New York five years later, it was big news—on the front page of the Wall Street Journal and in Time magazine as well as on ABC, NPR, and CBS. “It was all over the place my sophomore year of high school,” recalled Vorva. Girl Scouts’ subsequent change in its palm oil policy was the first time policy change was driven by girls in the organization’s 100-year history. The Girl Scouts chose to offset its use of palm oil by purchasing certificates from the GreenPalm program. Vorva had her lightbulb moment with GIS when she geocoded all the petition signatures from her Girl Scouts campaign and saw for the first time where supporters were located. So she decided to go bigger. Kellogg’s, based in Vorva’s home state of Michigan, owns one of the two companies that bake Girl Scout cookies. So Vorva and her team—with support from hundreds of thousands of people—began communicating with Kellogg’s to persuade the company to use deforestation-free palm oil. Not only did Kellogg’s comply by announcing in 2014 that it would implement a deforestation-free policy for all its products, but Wilmar International, which trades 45 percent of the world’s palm oil, also agreed to adopt a deforestation-free landmark policy. “Now, 90 percent of the world’s supply is bound under these deforestation-free commitments,” said Vorva. And most American companies currently have a sustainable palm oil policy of some kind in place. “Then I went to college!” Vorva exclaimed, throwing this timeline into sharp relief. College is where David DiBiase, Esri’s director of education, global business development, and Vorva met. They were both attending a talk about GIS being given by Esri founder and president Jack Dangermond at Claremont Graduate University in Southern California. Vorva was a student at nearby Pomona College. GIS had piqued her interest when she was in the JGI’s Roots & Shoots program. JGI uses maps and geodesign to work with surrounding communities to rehabilitate forestland and protect chimpanzee habitats. Vorva, speaking to the Roots & Shoots leadership council at Esri in 2016, likes the way GIS allows kids to map projects they are passionate about and see that they're part of larger movements. “The community mapping model for Roots & Shoots is for kids to make observations wherever they are and start figuring out, ‘What are the real needs in my community for people, animals, and the environment,’ and ‘What are the real resources [that] could help me with the problem I’m trying to solve? '” said Vorva. Her lightbulb moment had come during an introduction to a GIS course she took in college. She geocoded the petition signatures from her original campaign with the Girl Scouts. Dangermond identified DiBiase as the person responsible for making the massive project possible, so Vorva decided to make his acquaintance before jetting off to a meeting. “I wrote [DiBiase] this letter and passed it down to him in the audience, sort of introducing myself and why I was really passionate about this community mapping, service-learning module,” she said. A few weeks later, DiBiase called Vorva, telling her that he hadn’t received a note in class since he was in grade school. But he was obviously impressed. “Imagine meeting Jane Goodall as a 20-year-old woman,” he reflected. “Imagine the idealism. Imagine the determination. Imagine the principles. 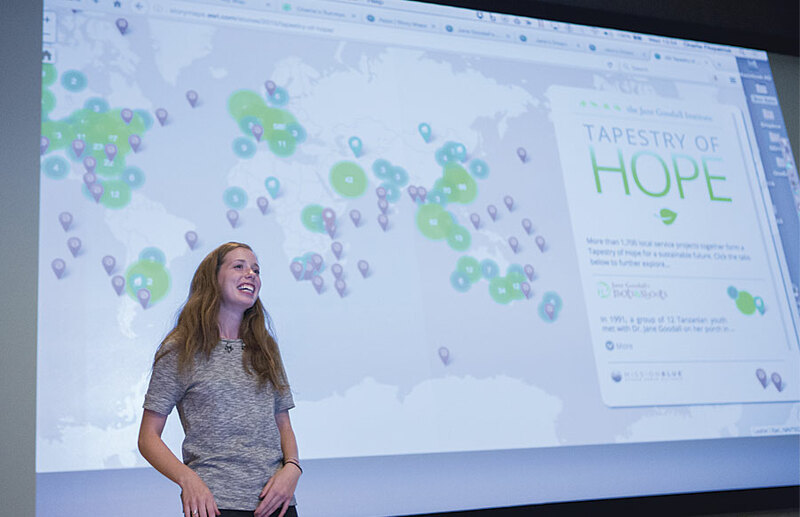 You’d be meeting Madi if you met Jane as a 20-year-old.” DiBiase asked her to speak at the 2015 Esri Education GIS Conference, which takes place just before the Esri User Conference in San Diego, California. In her presentation, Vorva told the audience how she came to realize the encompassing nature of conservation work—that it wasn’t just about protecting one species but that it included land-use and deforestation issues, required community engagement, and had political and economic ramifications. Vorva had realized the difficulties of implementing a plan to source sustainable palm oil because the supply chain is complex. The fruit is harvested at an oil palm plantation and sent to a mill and then to a refinery. Many plantations send fruit to one mill, and milled fruit is sent to different refineries so companies have no idea where the palm oil they purchase originally came from. “If you don’t know where the palm oil’s coming from, how can you claim that the actual plantations are adhering to these guidelines and rules? How do we ensure that traceability component?” questioned Vorva. 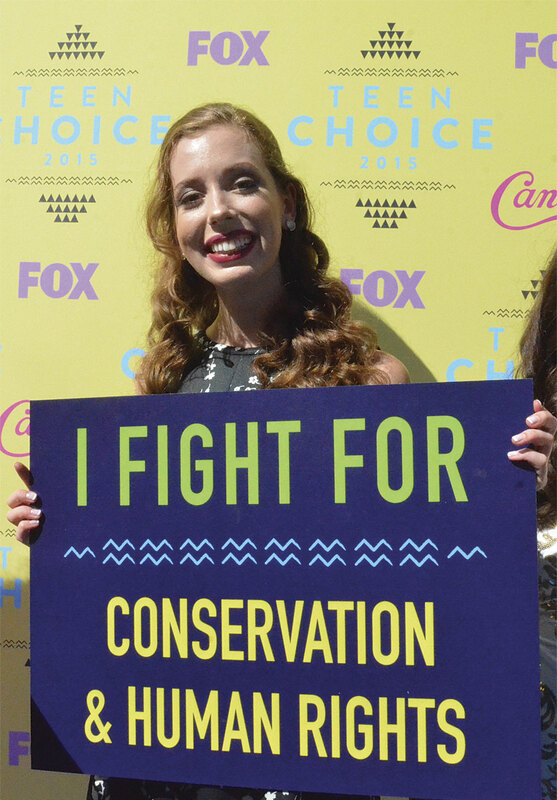 Vorva was honored at the Teen Choice Awards in 2015 for her environmental activism and conservation work. She realized that GIS could help her visualize the tangled supply chain, and she is working on that now with her partners. What Vorva perhaps didn’t realize right away, however, was how imperative maps were to digging deeper into the genesis of the issue she’d been involved in for nearly a decade. “My initial passion was conservation,” she said. “And then I realized that conservation is a very people-driven thing.” She saw this when she traveled to Colombia as a sophomore in high school to observe a community that was coming back to its land after being driven out to make room for what ended up being a failed palm grove. She saw it in 2014 when she went to Cambodia to make a short documentary about Mu Sochua, a democratic opposition leader who helps indigenous communities fight for land rights. She saw it when she went to Malaysia and Singapore last year to find out why palm oil is so prevalent in that part of the world and how its production affects politics, economics, and public health. “When we were in Malaysia, these people didn’t have maps, and they were going to court to fight for their land rights,” she recalled. Some nonprofits were trying to use community maps to show the tribes’ historic and traditional boundaries, but Vorva noticed that some of the basemaps being used were taken from old colonial maps. “That’s why I’ve gone back to mapping,” said Vorva. “The people who should be able to decide what happens to their community resources are people who are from those places. And oftentimes, they don’t have [formal] land rights and they’re using maps that are completely outdated—or they don’t know how to use them.” That’s why she thinks conservation groups should focus on community-centered mapping when helping people fight for their land. Vorva also thinks that community-based mapping can help kids get more involved with service-learning projects. “A map and GIS can help you visualize the world,” she said. She remembers being young and working on a project that felt so immense. “It was a lot of responsibility and also just hard,” she said. “I would be on the ground in Colombia and it was an intense position to be in to have to see these really gross human right abuses. […] And then having to represent that and explain in a two-minute NPR interview why the average American consumer buying Girl Scout cookies should care. It was a lot of responsibility for a kid.” She knows how young activists feel. And that is why she’s trying to make young people more aware of the technology. 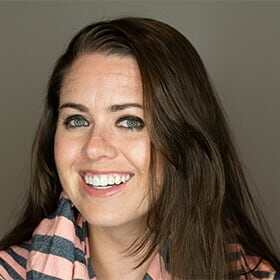 Part of her role as a board member for JGI is to increase GIS use within the Roots & Shoots platform. 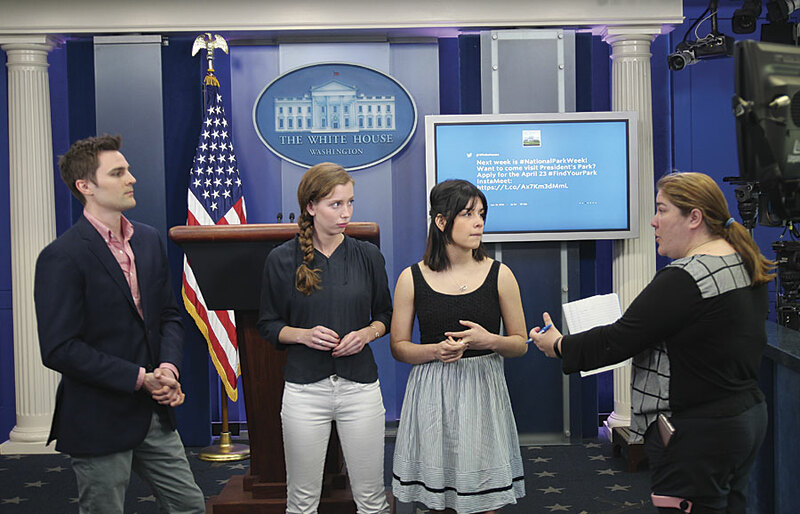 As a cohost of television show FabLab, Vorva got to shoot at the 2016 White House Science Fair and interview some of the top young scientific talent in the United States. She also did this as a host of FabLab, a 2016 television show on FOX that aimed to motivate girls to take more of an interest in science, technology, engineering, and math (STEM). Through the show, she attended the 2015 United Nations (UN) Climate Change Conference (COP21) in Paris and shot videos explaining to kids what the UN does. She also filmed at the 2016 White House Science Fair, highlighting the top young scientific talent in the country. She’s putting together introductory lessons on monarch butterflies to help kids understand why the species is threatened. She wants them to see how land-use changes have decimated their habitats. Then she wants the kids to use GIS to figure out the best places to plant milkweed (the only plant these caterpillars and butterflies use for food and shelter) in their communities to contribute to the national corridor being established. “She’s totally plugged into…youth leadership and conservation, so having that—plus an idea of how to use GIS to solve problems—that’s tremendous,” said Rob Stauder, product manager for GeoPlanner for ArcGIS at Esri, who helped Vorva work on her thesis project during her internship at Esri over the summer. GIS has certainly affected Vorva. And although she’s not entirely sure what she will do after she graduates in May 2017, GIS will almost certainly play a role in her future endeavors. “No matter what, I’m going to keep working on these kinds of projects,” she said. “I feel just as driven to do something as when I was 11.” Vorva also wants to continue inspiring kids to pursue their own passions and use GIS to perceive their effectiveness. 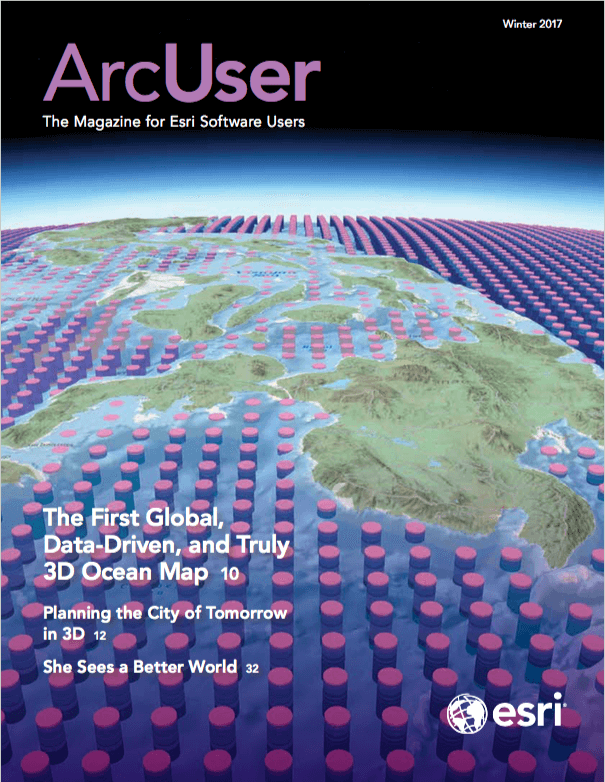 Citabria Stevens is the senior editor of Esri's ArcNews magazine. 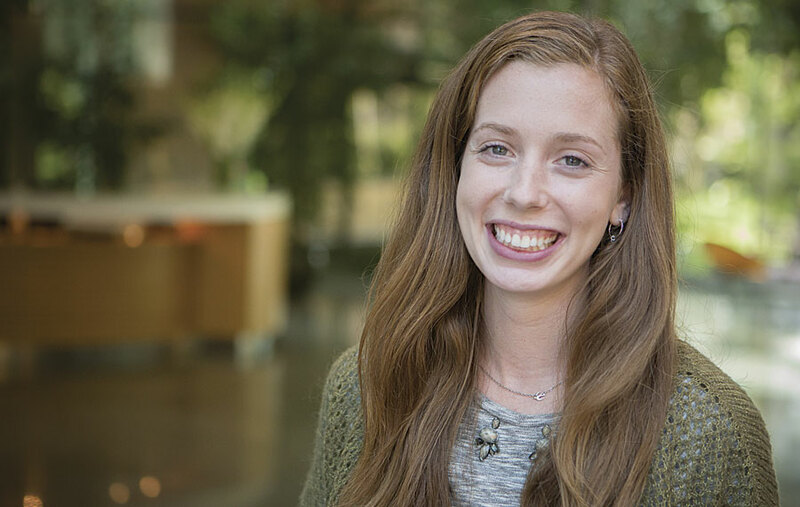 She helps users from all over the world tell compelling stories about how they employ Esri technology in innovative ways and ensures that readers stay well informed about ArcGIS solutions. Citabria began her career as a journalist at CNN before moving into the fields of international development and geopolitics. She holds a BS in communications and journalism from New York University and a dual MA/MSc in international history from Columbia University and the London School of Economics.